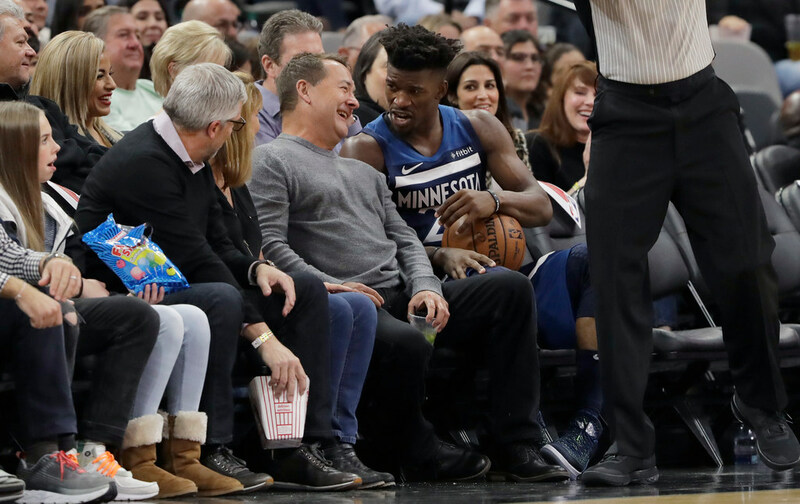 The Wolves are trying to impossibly thread some sort of needle where they try to promote the enjoyment of Jimmy Butler while actively trying to accommodate his trade request. *If you were a Minnesota sports fan who had been somewhere else for the last month — say, taking a bicycle trip through Europe or watching an entire MLB playoff game — and had no idea what had transpired with the Timberwolves from mid-September until tip-off Wednesday night against the Spurs, you might have watched the game and thought to yourself that nothing, really, was amiss. Jimmy Butler played well and gave a good effort. The defense wasn’t great, but it wasn’t awful. Jeff Teague was excellent. Andrew Wiggins had a discernible pulse. Gorgui Dieng provided a nice lift. It would have been an acceptable performance even under normal circumstances, but the 112-108 loss at San Antonio took on epic moral victory status because these are not normal times. (Combined with the Gophers football team and Wild’s recent moral victories, Minnesota is on quite the moral victory winning streak). But if you were here for the last month of drama and nonsense, there was no other option but to watch the game with a certain level of puzzlement and detachment as well. The Wolves are trying to impossibly thread some sort of needle whereby they try to promote the enjoyment of Butler while actively trying to accommodate his trade request. FSN’s halftime show was a mix of highlights — many including Butler — and an interview with owner Glen Taylor (who also owns the Star Tribune) discussing how they are working to trade Butler. The only newcomer who played as part of Tom Thibodeau’s nine-man rotation was veteran Anthony Tolliver, who vowed at media day to come out firing from three-point range but didn’t attempt a single long-distance shot in his 19 minutes on the floor. Six different players — including Derrick Rose, who played 31 minutes off the bench — attempted more field goals than Karl-Anthony Towns, who went just 2-for-6 and scored eight points in 22 foul-plagued minutes. Butler took a team-high 23 shots (making nine of them). What did we learn Wednesday? The Wolves have a collection of talented individuals, led by Butler. They suffer when Towns is ineffective. Rookie Josh Okogie has good energy … but not enough to get off the bench in the opener. As if realizing what he let slip out, Butler flashed a sly smile. Does he have 81 more games with this team? Until the Butler situation is resolved, the Wolves as an organization have hit a bizarre pause button. They might be able to pull things together for 48 minutes every couple of nights — the next test will be Friday’s home opener, where a returning all-NBA player will almost certainly be booed on his home court — but nothing about this feels normal. *Feel free, by the way, to provide your best photo caption in the comments for the above image from last night’s game. *In case you are wondering how things went for Miami — the other locker room being disrupted by Butler drama since the Heat has been reported as his primary suitor — it lost 104-101 at Orlando in Wednesday’s opener. Josh Richardson, the reported centerpiece of any Butler deal, took a career-high 21 shots (making eight) and finished with 21 points, five rebounds and three assists in 38 minutes. *Zach Lofton, who starred locally at Columbia Heights in high school but bounced around to five different colleges — including the Gophers, where he never played a game — made his NBA debut and played four minutes for Detroit on Wednesday. The Detroit Free Press had a nice story recently on Lofton’s long and winding road to the NBA.